Blood Orange Gose - Are You Serious Anderson Valley Brewing? Seems like brewing with blood oranges is a favorable new fad in the Maryland beer scene with at least Flying Dog Brewery (Bloodline Blood Orange IPA) and DuClaw Brewing Company (Hop Continuum No. 1 - Blood Orange Gypsy IPA) brewing an IPA version. I'm really digging this flavor profile, the subtle citrus tartness from the oranges provide a distinct difference to the heavier IBU side of the beer. I've also become interested in Gose styled beers after our recent #VABreweryChallenge visit to Manassas and Badwolf Brewing Company. Gose styled beer originated in Germany (Goslar) and is an unfiltered wheat beer brewed with ground coriander seeds and salt. It receives its sourness through inoculation with lactic acid bacteria. The Badwolf version was both sweet and a tad sour with a noticeable salt concentration at the finish. 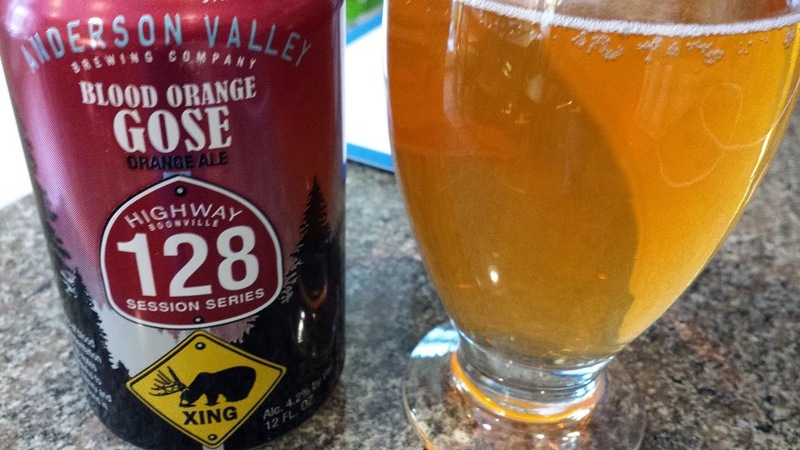 Today, I joyously discovered the Boonville, California's Anderson Valley Brewing Company Highway 128 Blood Orange Gose combining my two new beer obsessions. The brewery's Highway 128 Series is a set of funky session beers with the Blood Orange Gose weighing in at a measly 4.2% ABV. The blood oranges are added during fermentation and according to Director of Brewing Operations Andy Hooper, the Gose part of the beer is a major challenge. "Traditionally, this beer was made by allowing yeast and bacteria to ferment wort at the same time. It was packaged unfiltered and still contained loads of yeast and bacteria. Putting Lactobacillus bacteria into our cellar equipment and packaging lines would be a potentially huge problem and might contaminate other non-sour beers. To solve this problem, the lactobacillus is added in the brewhouse – specifically in the kettle. The bacteria are allowed to sour the wort and create the acidity needed for the tart flavor and funky aromas. After the bacteria do their job, the wort is boiled and sterilized. Now that all the bacteria are dead and gone, it’s safe for us to ferment, filter, and package the beer in the cellar without the risk of contaminating other beers. After fermentation is complete, a small amount of sea salt is added to enhance the body and soften the edge of the sourness." The Anderson Valley Blood Orange Gose is more sour than the Badwolf (a plus for me), but less salt on the tail - which resides mostly on the tongue (another plus). The beer starts with an orange citrus aroma and the blood orange refuse to leave the stage until the final, final act. There's a little effervescence which provides a refreshing finale - along with the salty finish. Overall this is a great beer. Good enough to have a blog post devoted to it. Care for a music pairing? Easily the funky soul and blues of JJ Grey & Mofro. Cheers. Update: Just had the Anderson Valley Holy Gose. Sour and refreshing. I also just tasted the Angry Chair Brewing Company Gose which was one of my favorites in our Florida Beer Tour. Michael Kaiser of WineAmerica recommends the Almanac Beer Co. Golden Gate Gose. Besides wine and beer, the Virginia spirits industry is growing rapidly. 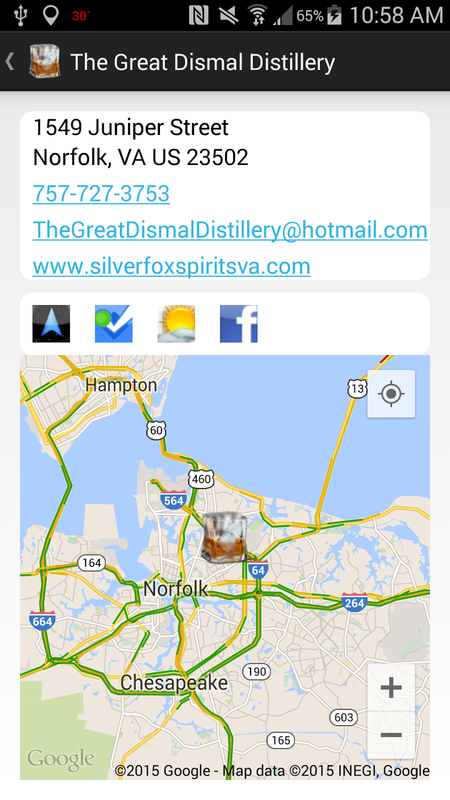 theCompass Mobile app lists 20 distilleries in the Commonwealth with tasting rooms; one of these being The Great Dismal Distillery - located in Norfolk. For those familiar with the area, you'll recognize the reference to the Great Dismal Swamp. The distillery was established in 2008 by Zachary Combs. 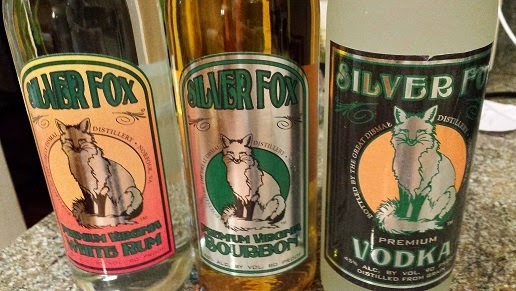 His first product was SilverFox Vodka, produced from a family recipe that "fermented grain to power the tractor on their small farm in the Fentress area of Chesapeake. What was left over, his grandmother turned into liquor. " His grandmother had received that recipe from her grandfather, known as the Silver Fox. Although, still a small operation, the distillery has expanded its product line into bourbon and rum. 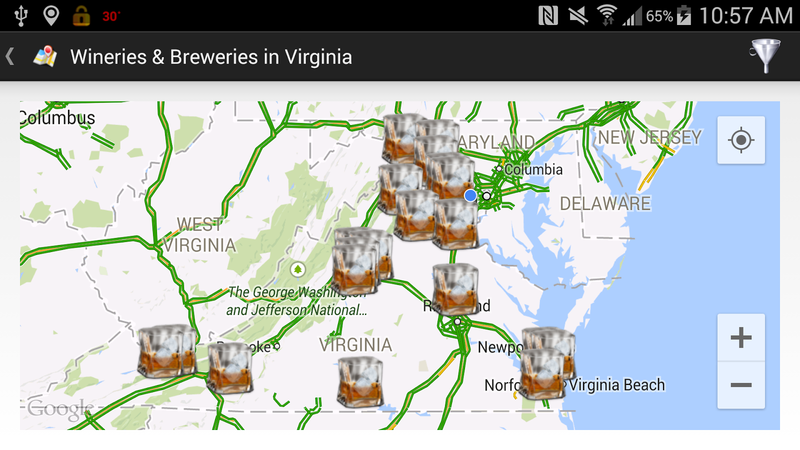 Each of these spirits are sold for $17, hopefully at your local Virginia ABC store. This month I received a three pack sample containing a bottle of each, which I have tried in various ways. In general, the overall concensus is that these spirits are designed for mixing and not for the snifters. The SilverFox Vodka is triple distilled then cut to 90 proof with a basic petrol aroma profile until a little water or ice is added. 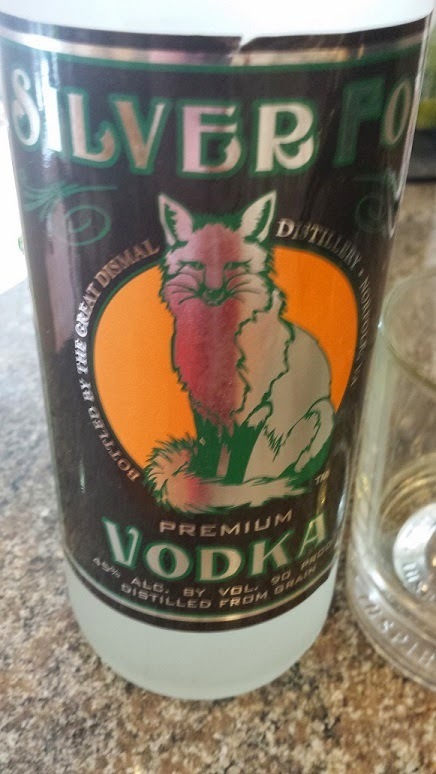 This dampens the alcohol and burn, revealing a sweet and smooth vodka with a subtle burn. I'd suggest using this in any of your standard vodka recipes. The SilverFox White Rum is distilled from pure sugar cane juice, not molasses, and then infused with vanilla. The profile is honey-vanilla, slightly on the sweeter side with very little burn. I first tried mixing in a Josie Russell, which creates a much different cocktail than when using straight rum - perhaps a little too much vanilla that overwhelms the apple. Instead, my two favorite cocktails was a Vanilla Chocolate Drop (equal parts rum and Godiva dark chocolate liqueur and a splash of cream). A great dessert. Another dessert type drink was a Root Beer Float, add enough rum to taste. The one disappointing aspect to the SilverFox White Rum is that I would have loved to taste before the infusion of vanilla; un-aged rum distilled from sugar cane is quite tasty. 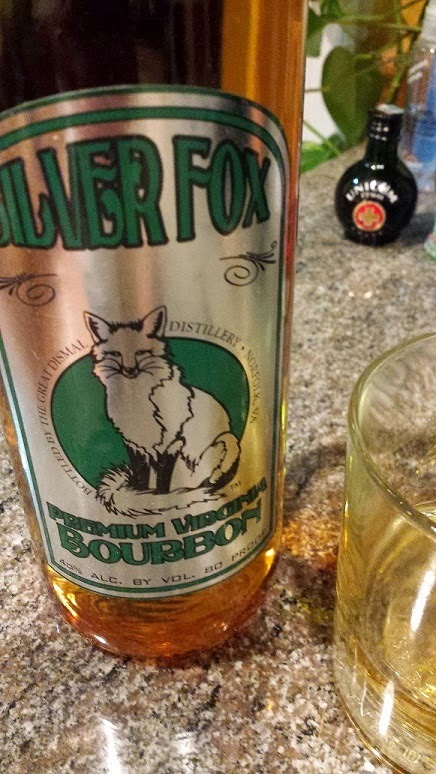 The SilverFox Bourbon, aged two years in oak, is the one spirit I preferred in a snifter, with a small dose of water. Neat, it starts with a sweet corn petrol aroma; candied corn - honey flavor; with no burn at the tail. The water pushes the petrol to the finish; leaving a sweeter vanilla-honey flavor. interestingly the burn increases slightly at the finish. I also mixed with the suggested ginger ale and yes, it works, but I preferred this medium bodied bourbon by itself. 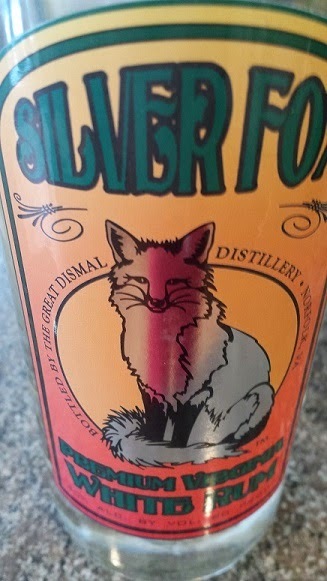 The SilverFox Bourbon won't be replacing my Buffalo Trace or Catoctin Creek, but is perfect for an everyday bourbon to have on hand. 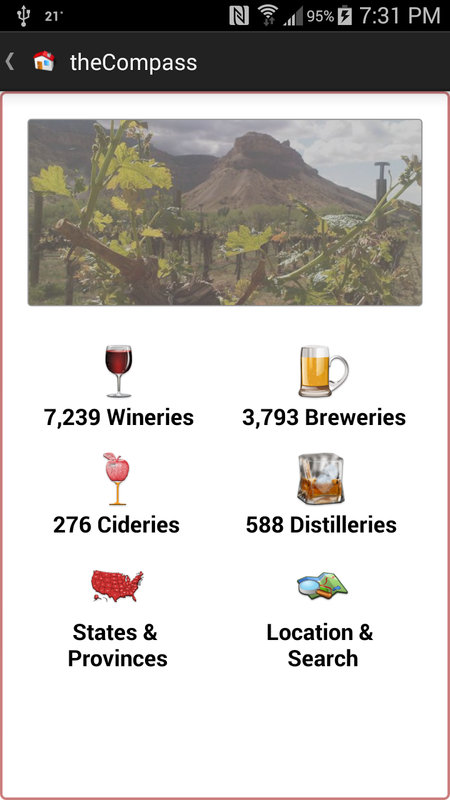 Everyone knows that Oregon is producing fantastic Pinot Noir, but did you know Oregon has 16 approved American Viticultural Areas (AVAs)? You probably did. Did you know that the largest, the Willamette Valley AVA is subdivided into smaller sub-AVAs? Yea, but did you know that in one of these sub-AVAs, the McMinnville AVA, one producer makes Pinot Noir from 25 year old vines that are own rooted? 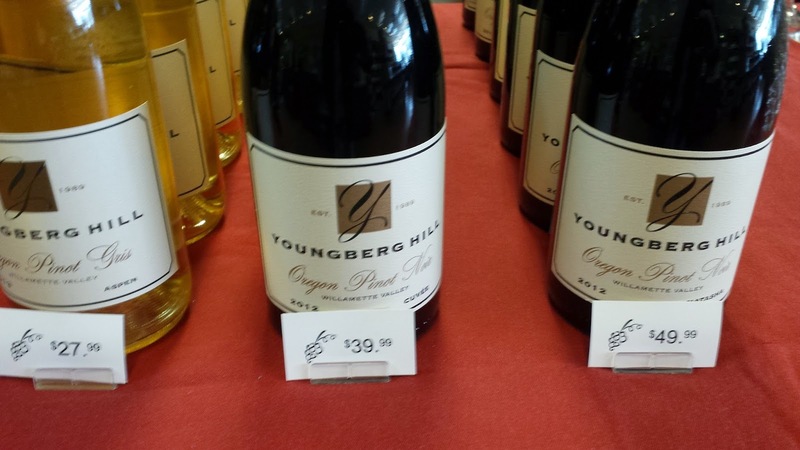 I didn't know that until Wayne Bailey, proprietor and winemaker of Youngberg Hill Vineyards (1,500 case production) came to Virginia on a short marketing excursion. And I caught up with Wayne to sample his wines and talk shop at The Wine Cabinet in Reston. 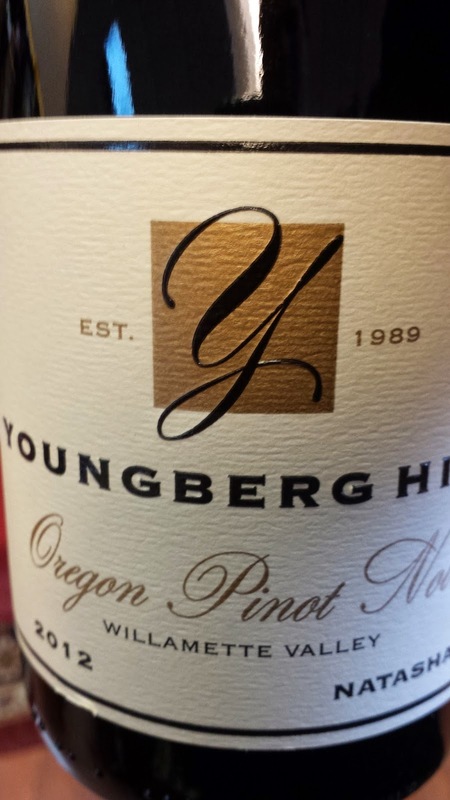 Born on an Iowa farm and tutored in Burgundy, Bailey purchased Youngberg Hill in 2003 after learning it was one site a majority of Oregon winemakers would seek to purchase fruit. The vineyard was first planted in 1989 by Ken Wright and the fruit used in his Panther Creek wines. Today these vines are known as the Jordan and Natasha blocks and the Pommard and Wadenswil clones are own rooted. The Natasha block is located at 600' and consists of sandy marine sediment that helps to ward off the phylloxera louse. The Jordan block is located higher at 800' on volcanic rock. Bailey practices both LIVE and Biodynamic farming and strongly believes that the healthy environment may even help the vines recover if the louse strikes. As long as he has patience, 10 years patience. Bailey also believes biodynamic farming's major benefit is providing guidelines on what not to do. For instance, in order to alleviate powdery mildew, organic vineyards can use sulfur, which remains on the grapes and soil and can creep into a wine. Instead, he uses whey protein. And instead of spraying to rid the vineyard of red or rustic mites, which would also kill beneficial mites, he leaves patches of grass that attract insects that feed on these specific mites. And there are plenty of other examples of sustainable agriculture practiced in Oregon. At The Wine Cabinet, Bailey was pouring samples of four wines, all estate except for the 2012 Cuvee Pinot Noir. We started with the 2013 Aspen Pinot Gris ($28, 11.8%). The wine has a strong apricot flavor and a depth not usually associated with the grape. Nice acids too. 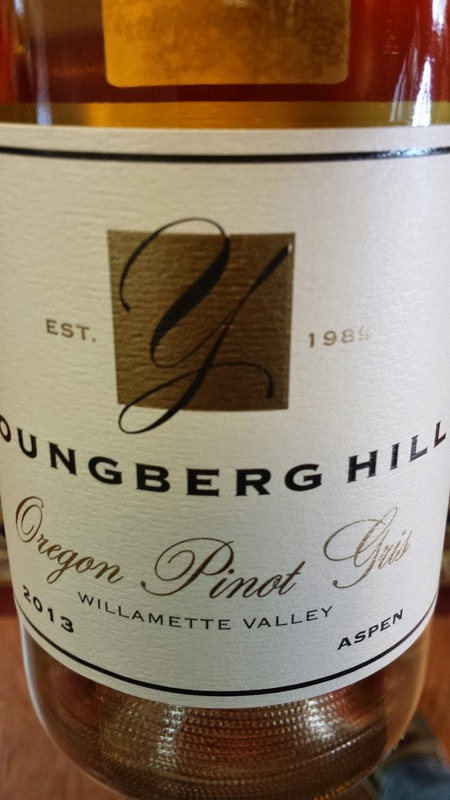 The 2012 Cuvee Pinot Noir ($40, 14.5%) is interesting in that it is composed of the Dijon 777 clone from three vineyards in the Willamette Valley AVA - including Youngberg's Bailey vineyard. This is a dark wine, both in color and with dark cherry flavors, easy tannins, and finishes with appropriate acids. I mentioned the features of the Natasha block above and the 2012 Natasha Pinot Noir ($50, 13.8%) is quite enjoyable with more dark cherry and some blackberry flavors, white and black pepper mingle in the palette, a little earthy funkiness, and the wine finishes with mellow tannins and plenty of acids. Bailey mentioned that the acids result from the higher altitude and the tannins are fruit tannins, not wood tannins. The final wine was the 2012 Jordan Pinot Noir ($50, 13.4%) which is a deeper, more complex, and more tannic version of the Natasha. With patience, this is one to lie down for awhile. 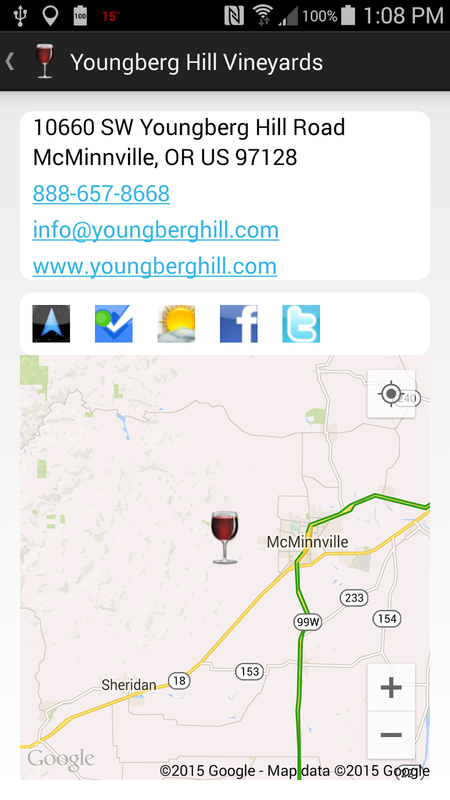 Younberg Hill strongly encourages visitors. The Bailey's operate an Inn on site and for those who like to cycle, they have initiated a program where after visiting area wineries, all purchased wine will be delivered to the Inn. No need to haul wine bottles in the backpack. Here's hoping I can be one of these cyclists soon. Cheers. Starting tomorrow thousands will give up drinking alcohol for Lent, perhaps based on their hangover from Fat Tuesday. While the endeavor is noble, is it necessary? 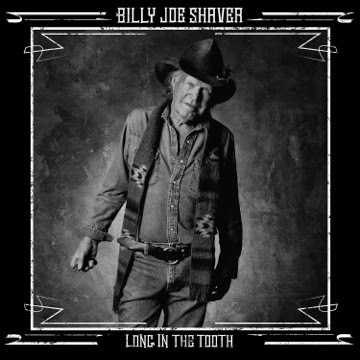 For, in the words of Billy Joe Shaver, "it's not what you put into your mouth that defiles you, it's what comes out". So I suggest to continue supporting your local wineries, breweries, and distilleries, and give up cursing instead. 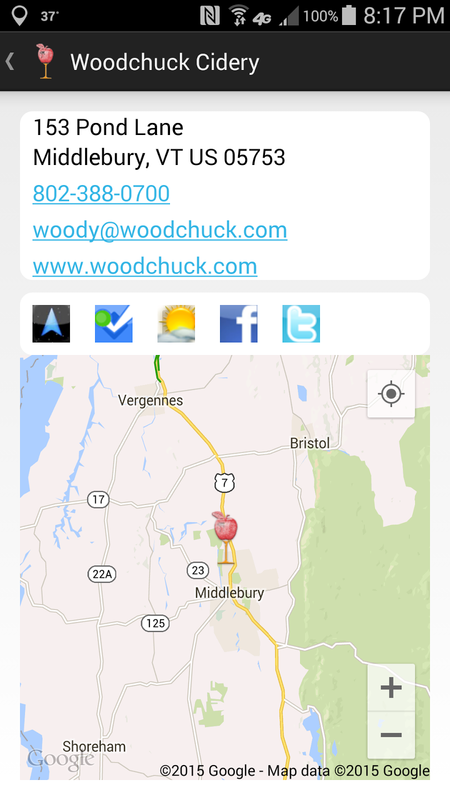 Shaver and theCompass Mobile Application will be happy. That's my lenten obligation. Cheers and be safe. Our first stop on the #VABreweryChallenge was to Ashburn's Lost Rhino Brewing Co. and this weekend we returned to visit two area breweries: Beltway Brewing Company and Old Ox Brewery. 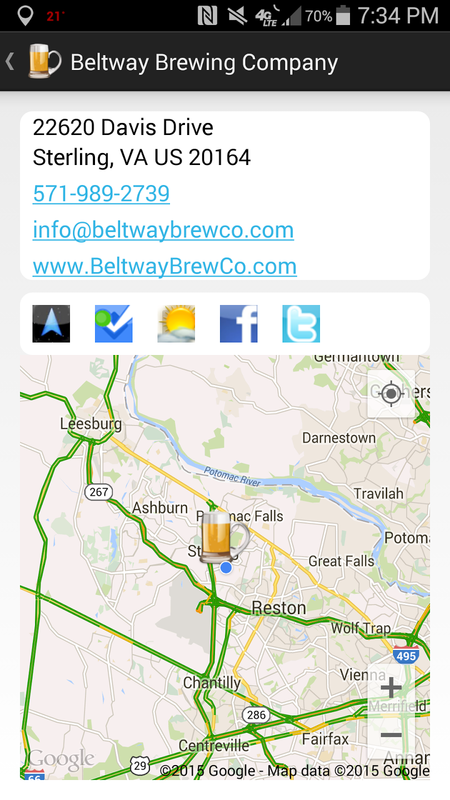 Beltway is a contract brewery that opens it's doors on Friday evening and pours the latest contracted beers. 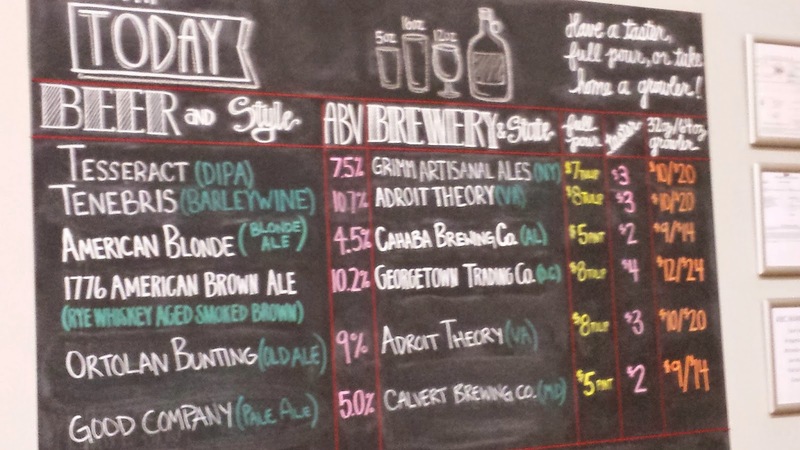 This evening they were pouring a couple high octanes brews from Virginia's Adroit Theory Brewing Company, but I started with the Cahaba Brewing Company American Blonde. Perfect for summer or southern drinking. 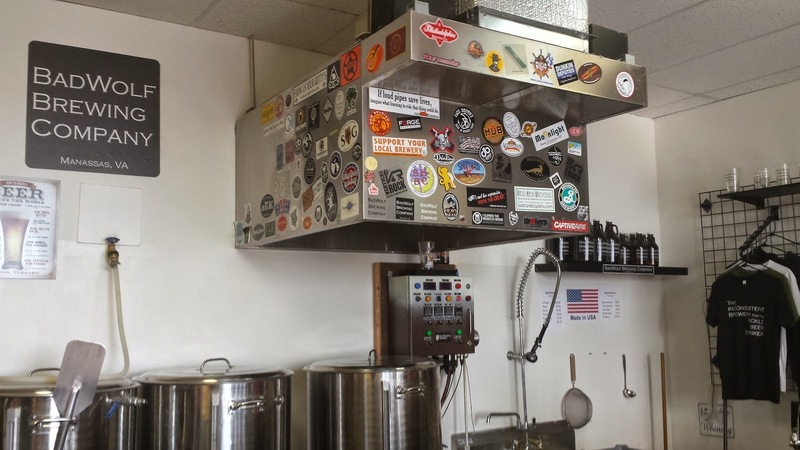 We also learned there's a new brewery opening in Upper Marlboro, Maryland - Calvert Brewing Company - and they contracted out their Good Company Pale Ale. More malt then hops, this was a popular offering on the low alcohol front. 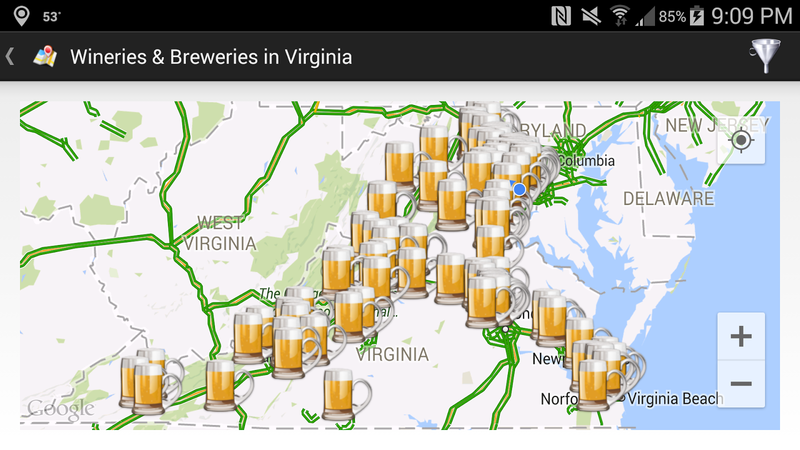 Looking forward to visiting Calvert Brewing soon. 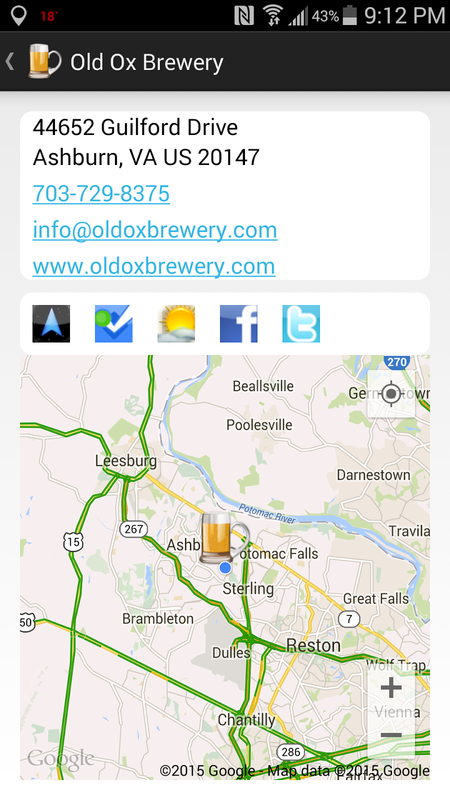 I've visited Old Ox several times based on their immediate proximity to the W&OD bike trail. They also have expanded hours on Fridays and the brewery was packed - interesting with a food truck and Frisbee golf in the production area. We also wanted to support the brewery while in the mist of a frivolous dispute with Red Bull who claims the Old Ox brand would somehow confuse consumers with the energy drink. Really? I recommend reading the brewery's open letter to Red Bull, who you would think has more important problems like losing a class action suit where consumers of their drink are entitled to a $10 refund. 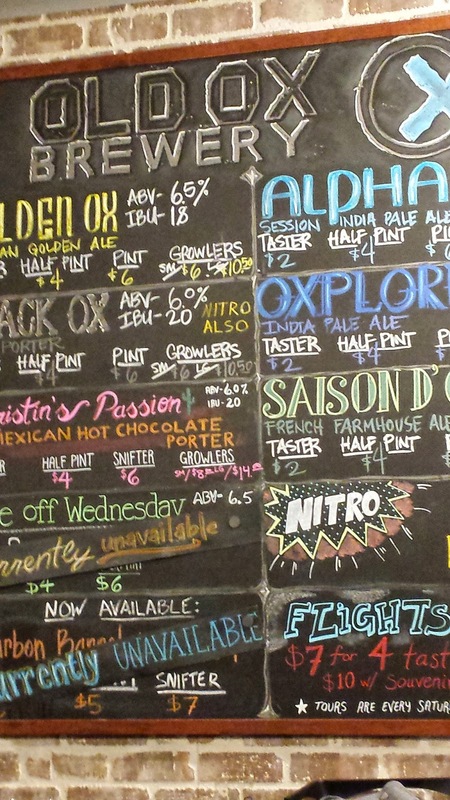 In any event, I loved Old Ox's Kristin's Passion Mexican Hot Chocolate Porter - just how I enjoy a porter - chocolate base with a soothing milky hoppy finish. 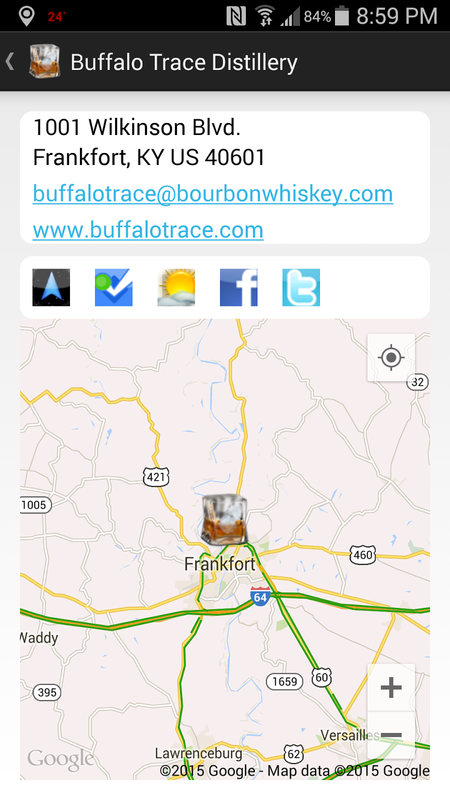 We wish Old Ox good luck in solving this dispute and safe travels to all who try to complete the #VABreweryChallenge or who are using theCompass Winery Brewery Distillery locator app. Cheers. In my younger years, my go bourbon was Ancient Age, first the light brown label and then the dark brown. 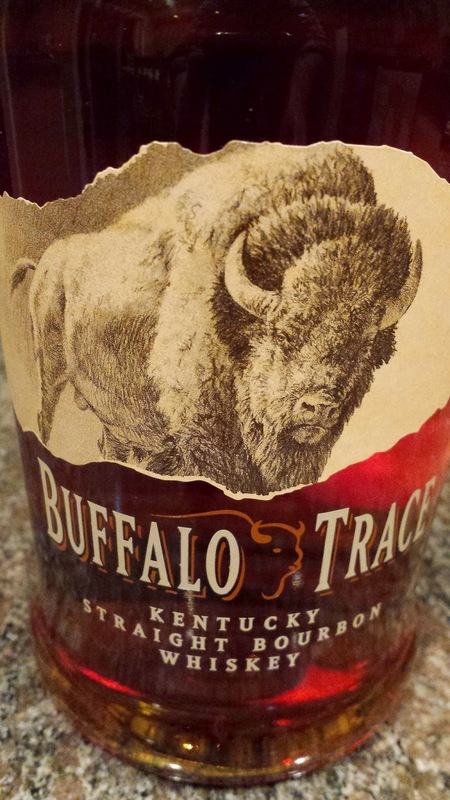 As the years progressed, I've stayed within the to Buffalo Trace Distillery - Sazerac family and graduated to their Buffalo Trace Whiskey ($30). Most are familiar with the fascinating history of the distillery from Colonial E.H. Taylor, Jr, George T. Stagg, Albert B. Blanton, Orville Schupp, Elmer T. Lee to now Harlen Wheatley. I would also recommend the Buffalo Trace Oral History Project produced by The Louie B. Nunn Center for Oral History at the University of Kentucky Libraries. Getting back to the the Buffalo Trace Kentucky Straight Bourbon Whiskey, the bourbon is distilled from a low rye mash bill (see the Bourbonr Blog). The spirit is then aged in the distilleries famous century old warehouses. The result is a fantastic whiskey. On the nose, I was presented with a major whiff of toasted vanilla almonds. On the palette, the nutty flavors mingle with caramel and honey, finishing with a vanilla-anise blend and a subtle burn. Quite nice. Maybe I need to do a comparative tasting with Ancient Age for old times sake. Cheers. Last night I received a couple of bottles of Cheeky Cherry, the newest addition to Woodchuck Cidery Out on a Limb Series™. The Middlebury Vermont cider house is marketing this cider for Valentine's Day; so I was expecting a sweet cider to pair with the holiday's red coloring. Instead, and to my taste bud's enjoyment, I tasted a dry cider (although not sure the exact R.S. level) full of apple and tart cherry flavors. In fact the tart cherry resides on the tongue long afterwards, with the apple's acidity providing a lively finish. I was also expecting some artificial-ness with the cherry flavor; but no, the cider house infuses dried Michigan tart cherries into the already fermented cider plus a douse of Belgian cherry juice. The base cider is composes of a blend of common eating apple varieties as well as bittersweet cider fruit. The alcohol weighs in at a reasonable 5.5%. 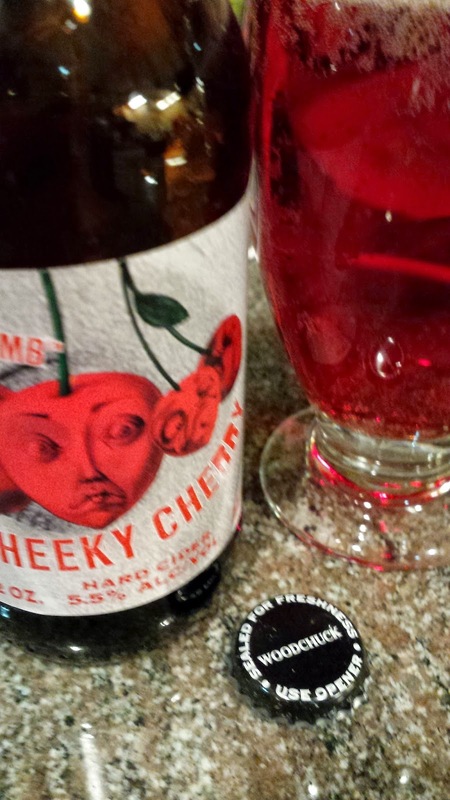 Thumbs up for the Cheeky Cherry. 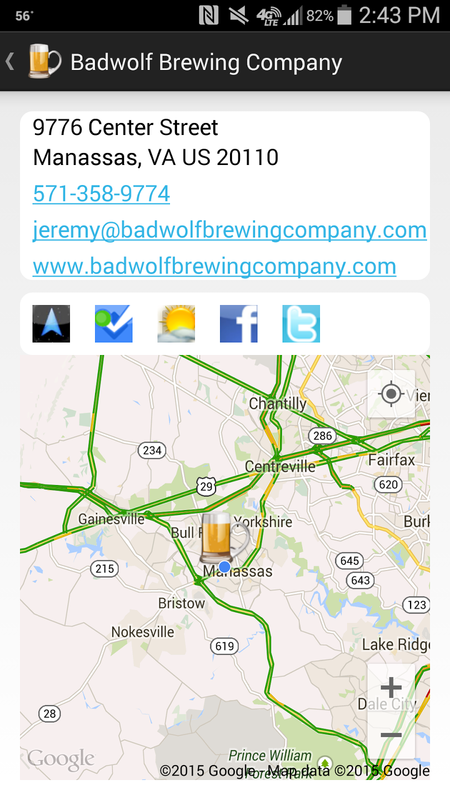 This weekend we continued our #VABreweryChallenge by traveling down Route 66 to the historic Civil War town of Manassas and two very new breweries: Badwolf Brewing Company (#3) and Heritage Brewing (#4). Badwolf is the smaller of the two and opened in July 2013 by Jeremy and Sarah Meyers. Did I mention small? They utilize a one barrel system; yet this nano-size can be a major benefit. There are plenty of unique beers on tap. This weekend featured six beers and I sampled all using their larger than normal sampler (8 ounces? per glass). I started with the Grisette (4.3%), a low alcohol session Saison with a lower spice profile which made it quite enjoyable. Next, was the most interesting, Bad Moon Rising (3.9%), a gose styled beer from Goslar Germany, that is to say, an unfiltered wheat beer brewed with ground coriander seeds and salt. Fails the Reinheitsgebot, but gets an exemption being a regional specialty. And as advertised, it is sweet and salty. Very interesting. 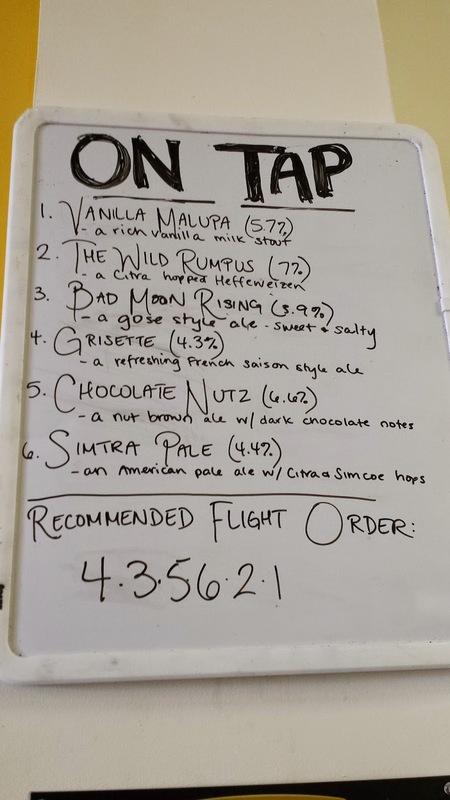 The Chocolate Nutz (6.6%) nut brown ale was spot on as was my favorite, the Simtra Pale (4.4%) - an American pale ale brewed with Simcoe and Citra hops. Surprisingly the highest abv, was their refreshing Hefeweizen, The Wild Rumpus. And we closed out the tasting with the Vanilla Malupa (5.7%), a full bodied milk stout brewed with vanilla beans. Not bad. The only negative comment I can give the brewery is the cramped quarters on a crowded day; otherwise their beer is solid. 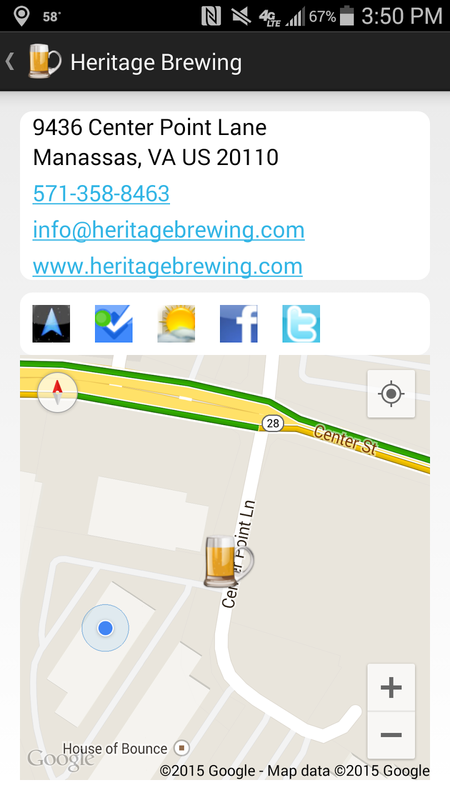 As a more spacious brewery, Heritage Brewing, provides plenty of room along their L-shaped tasting bar. 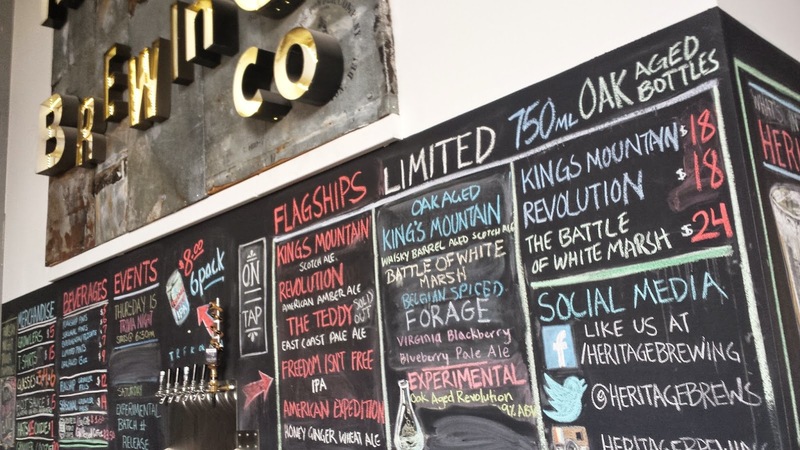 This veteran owned brewery also opened in 2013 and they claim to use at least 90% organic ingredients. 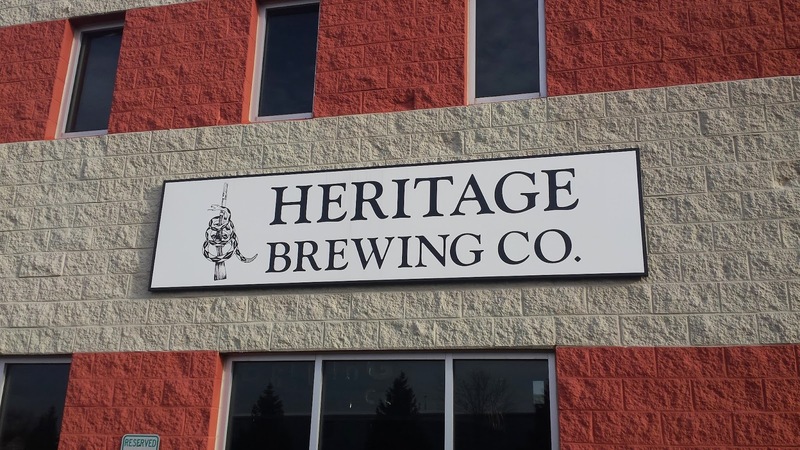 Heritage bases their production around five flagship beers; the Freedom Isn't Free IPA, Kings Mountain Scotch Ale, Revolution American Amber Ale (brewed with organic oranges), The Teddy East Coast Pale Ale, and the American Expedition - a honey ginger wheat ale. On this visit, I stuck to the Freedom Isn't Free IPA - a solid offering with plenty of IBUs to produce that refreshing hoppy finish. Our tasting neighbor preferred the American Expedition - so that's at least two popular beers. Heritage also has a great deal on their canned beers - $8 a six pack. That's a bargain. 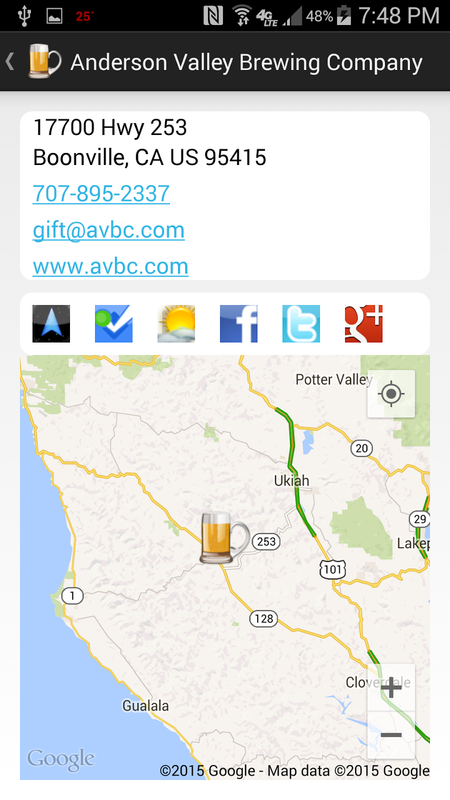 Cheers and safe travels with theCompass Mobile App. Protocol #WineStudio continued their January discussion on Wine Credentials: Letters of Distinction with more credentials from available from the San Francisco Wine School. These include the California Wine Appellation Specialist® (CWAS) program, the French Wine Scholar (FWS) Program, and the Italian Wine Professional (IWP) Program. And to assist our appetite samples from Hall Winery were distributed to several lucky participants. Me being one of these. Like Steven Kent Winery, Hall sends their staff to the San Francisco Wine School; they participate in the Certified Specialist of Wine (CSW) program and plan to start sending staff to take the CWAS. A clear benefit to both the winery and its customers. The two wines they sent were clear benefits to those of us tasting; these were the 2012 HALL "Eighteen Seventy-Three" Cabernet Sauvignon ($80) and the 2011 HALL "Jack's Masterpiece" Cabernet Sauvignon ($125). The "Eighteen Seventy-Three" honors Captain William Peterson, who in 1873, and established the first incarnation of the many wineries that have operated on Hall's St. Helena site. Although the vineyard Peterson planted was lost to phylloxera, elements of his winery are still evident in the restored winery. The "Eighteen Seventy-Three" is an incredible wine, made from all Napa Valley fruit and aged in French Oak. Allow this wine to breathe because their are layers of chewy tannins ready to be released. These tannins are proceeded by creamy blackberry flavors then mild acidity. 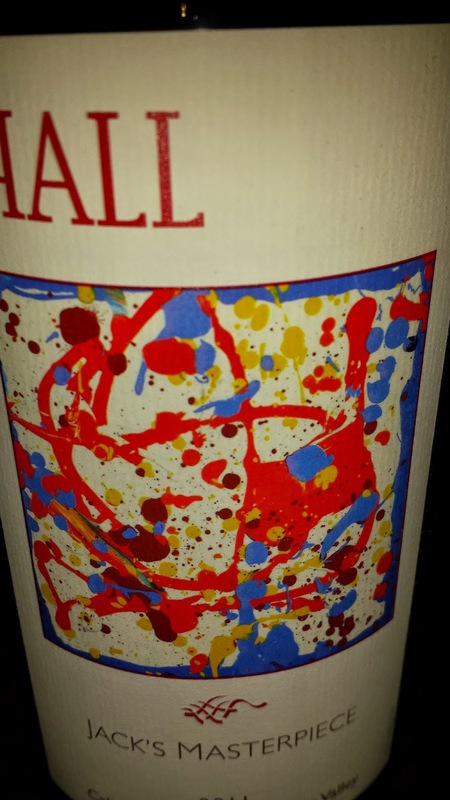 Jack's Masterpiece is the creation of HALL President and former Winemaker, Mike Reynolds, who was tasked to devise a special release wine. 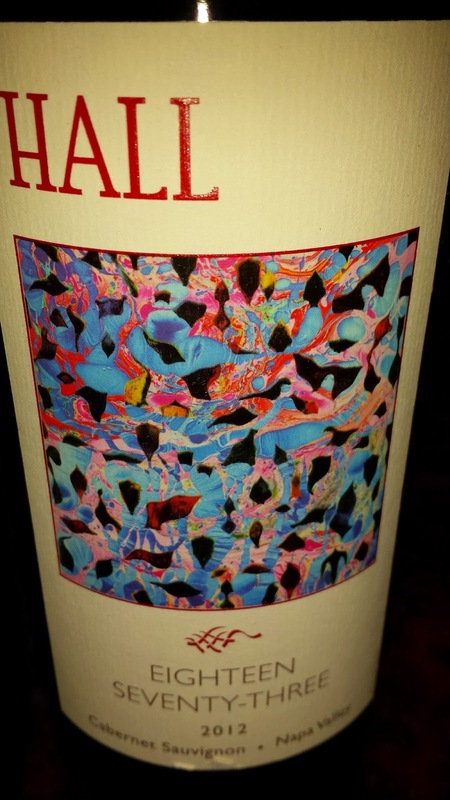 If you notice, Hall supports the arts and uses different paintings in their labels. In 2006, Reynolds' then 18-month-old son Jack presented him with a canvas painted to celebrate Father's Day. Reynolds now had inspiration for the wine, Jack's Masterpiece. The 2011 incarnation is more subtle and earthy than the 1873, but contains plenty of depth and cherry flavor. Another beautiful wine.